Most county historical societies in Illinois rely on donations and memberships, but the Madison County Historical Society receives a generous infusion of tax dollars to run its museum and library. County leaders just cut the total, but why do they provide taxpayer support at all? It was a historic moment, because most other counties in Illinois don’t use tax dollars to support their history museums. Of 50 county historical societies surveyed in Illinois, only five receive tax dollars. Madison County by far spends the most, last year handing the history museum and library $273,293 in taxpayer money. In second place was McLean County, with $65,708 in taxes going to its history museum. 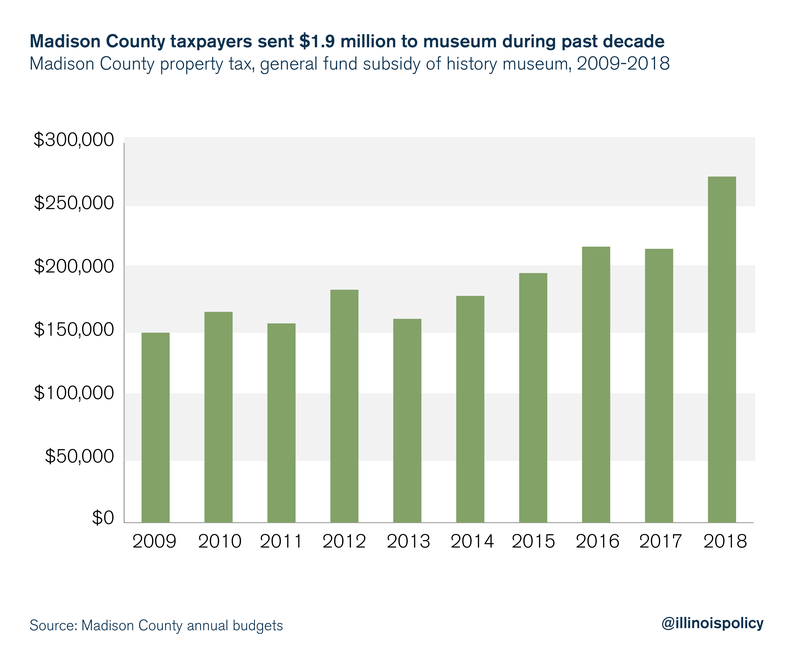 The taxpayer burden from the Madison County history museum increased 82 percent during the past decade, with the budget growing from $149,989 in 2009 to this past year’s peak. In total, the county sent $1.9 million to the history museum from 2009 to 2018. But the new fiscal year will be leaner for the museum. County leaders stuck to their pledge to keep the property tax levy flat, so they cut $80,000 from the museum’s 2019 budget. It will receive $194,899 in 2019. A museum board member tried to persuade county leaders to spread the cut across all county departments, which he said would cost each department about $2,400. The museum in Edwardsville is currently closed for renovations, which Hansen reminded county leaders were being financed by private donations. Which raises the question: Why isn’t Madison County’s history museum entirely funded by private donations, as are the vast majority of its peer entities? Why are taxes being used at all? That’s a good question, Madison County Chairman Kurt Prenzler said during an interview. He said the county subsidized the museum from its general fund, but is shrinking that help as the budget gets tighter and as a former surplus in the museum’s account is depleted. Still, there is a museum property tax levy of .002 cents per $100 assessed valuation that will bring in $101,270 this year. The property tax was approved by county voters around 1964, when the museum moved out of the courthouse and into the historic Weir House in Edwardsville, said longtime employee and archive manager Mary Westerhold. She said the board understands county leaders intend to decrease support, and are looking at fundraising options mainly aimed at completing museum renovations. Prenzler said he’s sympathetic to the museum’s mission and its many volunteers. He also said he’s an advocate of benchmarking: If Madison County stands out among counties and their support of historical societies, then the issue should be examined. When Republicans in 2016 gained the majority on the Madison County Board as well as the chairmanship for the first time in decades, they did so with the promise to shrink government and be responsible with taxes. One way to save a quick $194,899 would be to end taxpayer support for the Madison County Historical Society. Nearly half of that money could be cut directly by county leaders, the other half would require elimination of a property tax voters approved more than 50 years ago. The collection was intended to be permanent. No one promised the tax dollars would be.